MEDIA RELEASE: The state’s peak political body for Victoria’s shooting organisations is calling on the state government to allow shooters to use 22 self-loading rifles after a 20 year ban. The Combined Firearms Council of Victoria says it has written to the Premier urging him to reconsider the state’s position in light of shooters’ concerns. Council President, Bill Paterson, said the move would be entirely reasonable, arguing 22 rifles are in reality, “bunny guns”, and bore no resemblance to military style rifles of the type which led to the ban in 1996. “For a start the 22 rifle has significantly less firepower than what you find with larger calibres, and it has a very practical use,” he said. He said the ban on self-loading rifles occurred after the shootings in Port Arthur in 1996, in a state which had very few controls over firearms when other states already had effective licensing and limitations. “The problem is the political response back in 1996 did not take any of these factors into account when it should have. 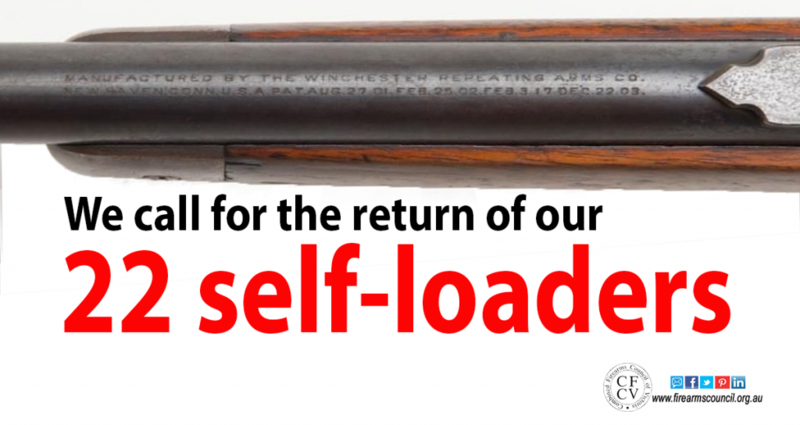 The loss of the 22 self-loading rifle was at the top of shooters’ concerns in a recent survey we conducted and their return would go a long way to providing a better balance in firearm regulation”. He said the issue of 22 self-loading firearms will remain high on the Council’s list of priorities for the 2018 Victorian State Election. Fantastic work. Finally things are being said that have needed to be said for a very long time. Well said, lets hope common sense prevails and that the whole issue is scrutinised carefully and accurately. Absolutely agree. LAFO have proved ourselves over the last 20 years while governments have done bugger all to address the illegal firearms used in now commonplace drive-by shootings. Will the states view that – It was a mistake (repeal the law) and potentially open themselves up to more claims for compensation by people who feel they would like their original rimfires returned. Paul B, you are right, Domestic Violence laws that are used tactically, and based upon false evidence in about 20% of cases also do not help, and continue to salt the wound. I always thought when I first read the new laws that the biggest problem was not the removal of semi automatics, but the statement that firearms ownership was a privilege and not a right. All of our woes have come from this. The big problem for the Vic Premier is the NFA. The only way around it for him, other than breaking Victoria’s word, and attracting sanctions from the Commonwealth would be to force a real and proper review of the NFA and the legislation. This has NEVER occurred. The only way to effect change is for shooters to get organised and vote as a block, Nothing focusses the mind of MP’s quite like their political demise. There are enough of us to achieve much in this regard, but shooters continue to waste the opportunity. Wouldn’t you be beter off discussing the retention of the firearms we have access to, and maintaining the hunting area availability for firearm owners to use. I too lost my semi-automatic rifles in the ’96 buyback, but it has not effected my hunting ability using bolt/lever action firearms. We are fighting a losing battle with the government, because we have no individual party standing up for Firearm owners. Once we have unity, then we will have the power of numbers, to help sway the way governments think. We are still divided and fragmented. Become one voice under one party, that has the interests of all interests from country people, semi rural Interests, hunting clubs, fishing clubs, 4X4 clubs, Farmers, Primary Producers Shooting clubs, should all be using one voice and stand together. This is what is important! I am a proud member of the Australian Country Party and I believe that this is the party we need to be our voice. I was impressed with the Country Party, and I am impressed with the LDP. I think the SFFP is providing a good voice, as well as Ricky Muirs Auto Enthusiasts Party. It’s a shame they weren’t all under one heading. Too much division is allowing parties like the Greens, Labor and Liberals to pick us apart. Whichever one of these parties seems to be winning the majority of the support will get my vote this time round. We need boots on the ground! One this is for sure is vote below the line and not give away any votes to the 3 major parties. NZ have 22LRs semi autos and centre fire semi autos both with unregulated silences and there gun crime is lower than ours. Silencers and semi auto 22 is the best combination for rabbiting and vermin control add night vision and they are toast. When will the government stop punishing legal and law abiding citizens for what criminals do? Thank you for being a united voice for all shooters! John… a bit late now.. I handed in both mine, and my fathers Beretta super sport semi auto’s, I think I received $390 each..try replacing them for that amount now.